With cousins Nathan Andrade and Christian McLeod growing up nine streets apart, you might correctly assume they would have a close relationship. But while lots of cousins do, few make it their business to make the world a better place. It’s here that the Massachusetts teens really stand out. It all started when they were just in grade school and became part of a New Bedford youth program. Saturday Academy is a weekend program for boys designed to reduce the impact of negative behaviors by building and strengthening positive ones. It strives to improve academic performance, socialization skills and self-esteem. Older students serve as “junior leaders” for the younger ones. Andrade (he’s on the right in the photo) and McLeod have been involved since third grade. After a few years, they became junior leaders. “Christian and I, we graduated high school, and we’re still active members of that program, supporting it whether we’re there or not there,” Andrade says. The program features classes in the morning, but the time after lunch is for cultural/enrichment activities, which also include service to the community. “The program is mainly based around community service and academics,” McLeod adds. “For the students, we say it’s a field trip so they’re excited to go, because if you’re gonna tell a middle school student, ‘Oh, we’re gonna go do some community service,’ they’re not gonna be as excited,” Andrade points out. At nearby Buttonwood Park, they created a sensory garden for the blind and deaf. Another time, they raked leaves and planted new flowers and shrubs. Saturday Academy isn’t the only program that needs volunteers, though. McLeod is involved in others in New Bedford. “I also work with the Southcoast Hospital group. It’s called the PRIDE program,” he says. That group’s curriculum focuses on life skills, healthy behaviors and positive constructive actions that allow young people to be successful now and later in life. McLeod also volunteers for the Boys and Girls Clubs of America. 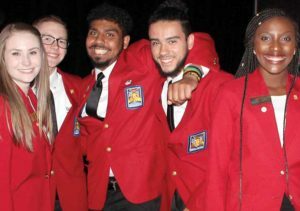 The volunteer experiences at Saturday Academy and others came in handy when the cousins became SkillsUSA members at Greater New Bedford Regional Vocational-Technical High School. 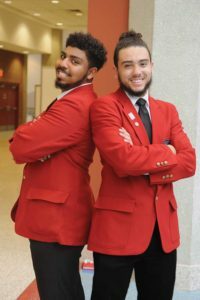 Strengthening their kinship, both competed in SkillsUSA’s Major Appliance and Refrigeration Technology event, and both became national medalists. McLeod won the gold in 2015, and Andrade earned the bronze in 2016. The next year, the pair earned the President’s Volunteer Service award, presented at SkillsUSA’s national conference in Louisville, Ky. Both young men say their previous involvement in community service and leadership in New Bedford made a huge difference in their SkillsUSA experience. Andrade and McLeod plan to pay it forward by creating a weekday program similar to Saturday Academy called “The Right Path.” They’re working on community support for the program, but Andrade says it’s nothing to sweat over. “Both of us are great at networking because it’s so easy for us just to talk to people. “We can just meet a new person, shake their hand and we can have a conversation,” he adds. “It just clicks like that.” The cousins drew interest in their plan from none other than the New Bedford Police Department. McLeod met the new chief about financial support for their new venture. As for the future, Andrade is attending Bristol Community College in Fall River. McLeod enlisted in the U.S. Navy, where he is training to be a nuclear engineer with the goal of becoming an officer. These are very different paths for a pair as close as Andrade and McLeod. Their mothers are sisters, making the young men first cousins, yet they act and feel more like brothers. “I think the longest we’ve ever been away from each other was what? A week?” Andrade asked when interviewed last summer. “I think we can survive those four or five weeks [during basic training],” McLeod responded. “It will be like he’s going to college and I’m going to college … we’ll be studying similar things. So, we’ll be able to have FaceTime to call each other and help each other with homework.